Combine all stock ingredients in a pot and bring to the boil. Reduce the heat and simmer for 30 minutes. 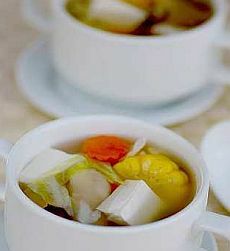 Strain the soup stock and return the soup to the stock pot. Bring to the boil again. Add carrot and cook for 5-6 minutes. Add corn kernels, cabbage and beancurd. Stir and bring to the boil for a minute or two.